But down to today’s action: We had five gold medals up for grabs on the final morning, with the finals of the course races for prone and SUP, as well as the cool little ISA Team Relay. The Danish Viking. Epic performance. Goes back to back and defends his course race title from last year. Shakira Westdorp from Australia. Amazing fighting effort today to take gold in the women’s course race. 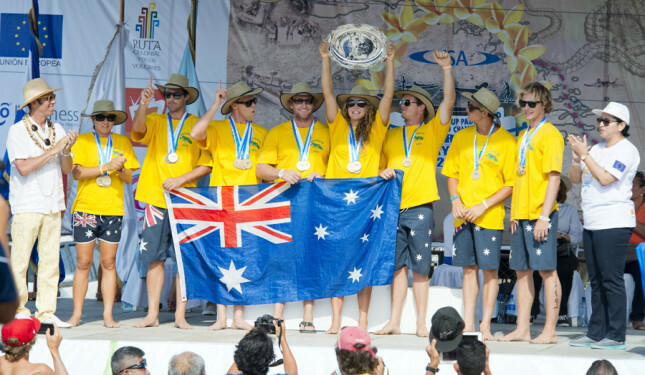 Australia dominated the final day, taking 4 golds and 1 silver to comfortably seal their third straight team trophy. Their overall medal haul was 6 gold, 4 silver, 3 bronze. Dominant. Australia made it a winning start early in the morning, when Jordan Mercer picked up her 6th straight individual ISA gold medal in the course race final. Despite some stiff competition from the experienced duo of Carter Graves (USA, silver) and Itziar Rivera (Spain, bronze), Jordan was too strong and pulled away in the stiff breeze to secure more valuable points for Team Oz. Jordan has now won every single women’s prone gold in the history of this event… machine. The young star was also acting as the Team Captain for the Aussies this year and, despite some reports (i.e. me) suggesting the Aussies were vulnerable this year, held her squad together to near perfection. Australia picked up a medal in every single event and were far too strong for USA in the overall team standings. Rhys Burrows made it four golds from four prone events for Australia in the men’s course race an hour later. 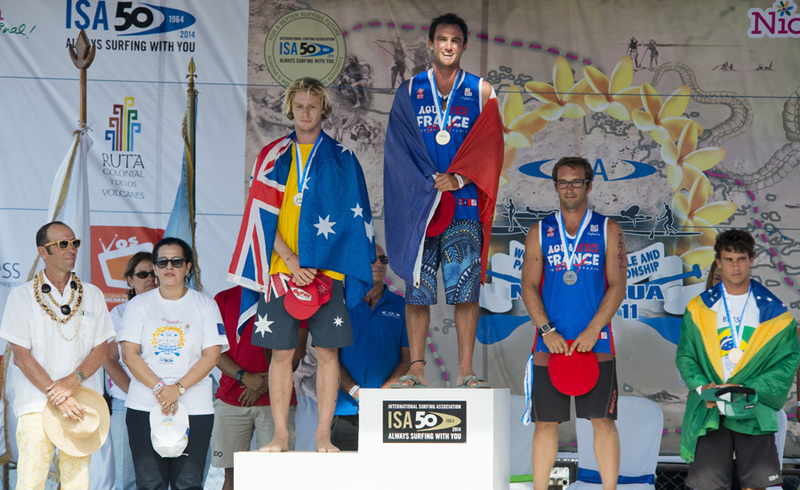 The Aussie was pushed by Kiwi Andrew Newton, while fellow Aussie Rory Chapman took the bronze, however Burrows looked in control right from the start. 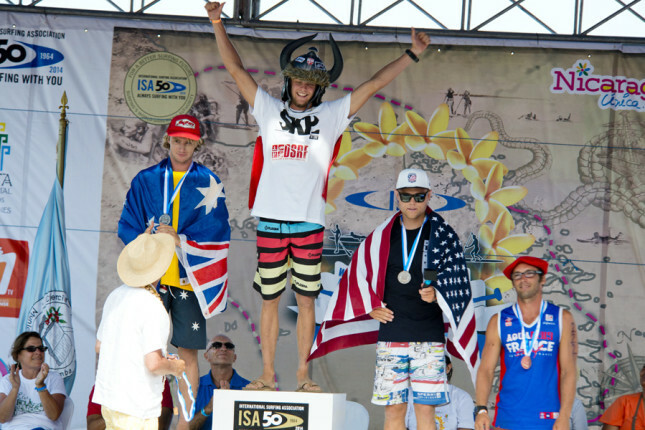 Rhys has two golds from this event, while Australia now has a perfect 12 wins from 12 prone races in the three years of the ISA Worlds. This nation will be very hard to ever beat in the future if other countries can’t start matching them in the prone divisions (and considering prone is a national sport in Aus by way of the surf life saving culture, it’s gonna be tough to find anyone that can). 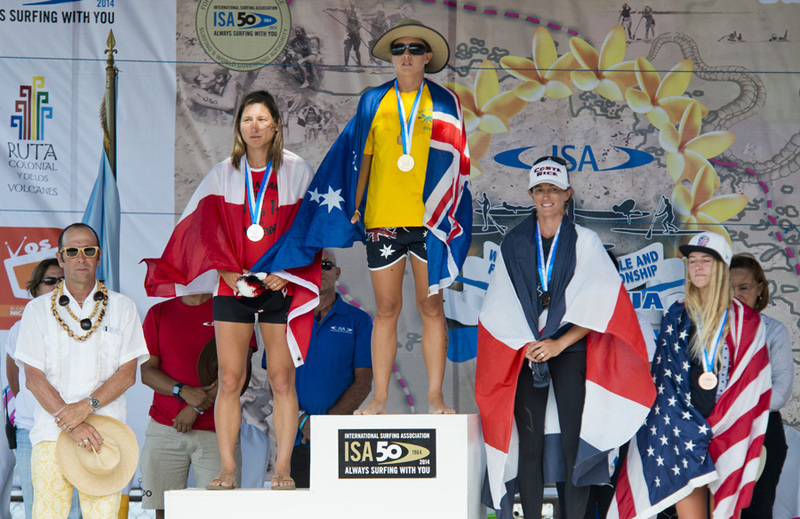 The women’s SUP course race final was always going to be a three way battle between Jenny Kalmbach (Costa Rica), Lina Augaitis (Canada) and Shakira Westdorp (Australia). Jenny started strong and led for the first lap but Lina and Shak were looking comfortable sitting on her tail. The lead changed hands several times, with all three trying to make a move on the outside downwind leg, but for the first couple of laps it was neck and neck. Jenny mentioned post race that she tried to sprint hard off the line and gap the other two girls straight away, but Shak and Lina were simply too quick. After trading the lead, on the third and final time around the course Jenny started getting dropped when Shak began to up the pace. Lina was still looking strong at this point, but a series of quick buoy turns and sprint surges gave Shakira a slight edge. As they rounded the second last buoy, the Aussie had three board lengths on her Canadian rival and didn’t look back, hammering it towards the final turning can and sprinting in towards the beach. An ecstatic Shakira Westdorp crossed the line screaming with emotion, taking yet another gold for Team Australia in an event they weren’t favoured to win. The medal caps off a remarkable run of results for Shak at the ISA Worlds, stretching back to the inaugural event in 2012. 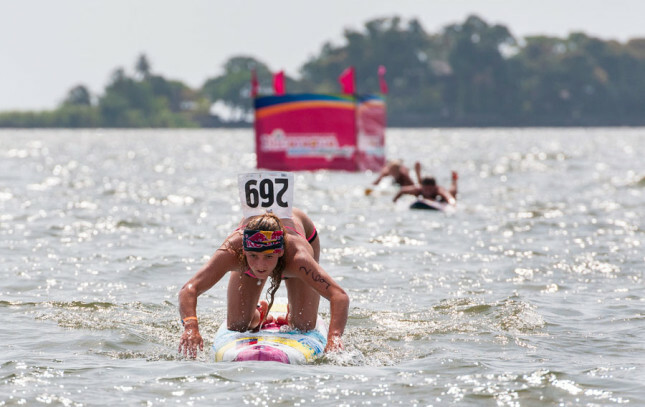 The Starboard team rider has now won medals in the SUP surfing, SUP long distance, SUP short course and Team Relay, making her perhaps the best all round athlete to ever compete in this championship. Lina fought hard and was so close at the end, however it was always going to be hard to back up after winning gold in the distance race, both physically and mentally. Jenny was up there most of the race but these two ladies were just too powerful on the day. Fighting very bravely the whole race was young Shae Foudy from the USA. The 15-year-old, a surprise copper medalist in Friday’s grueling distance race, had to dig deep several times in this race. After the 18km distance event Shae actually ended up on an IV drip, such was the level of her dehydration. Coming in to today the young San Clemente paddler was probably still feeling the effects of that big performance and it showed at a couple of crucial points. Sitting in 4th and with a clear gap to the other women, on two occasions Shae rounded one of the buoys and headed in the wrong direction, going off course and risking disqualification. But fortunately for Team USA, the Riviera paddler quickly found her line again and didn’t lose too much ground. It did however throw the door open to Laura Quetglas (Spain), Barbara Brasil (Brazil) and Celine Guesdon (France) to make an attack on the 4th and final medal spot. After a frantic sprint in the final half a lap, in the end, and in a show of just how much potential this youngster has, Shae held on and took her second medal in three days. Team USA have acted like a great team unit this week in general, led very well by their manager Ian Cairns and race coach Jim Terrell. If the women’s race gave us some excitement, the men’s race gave us a bit of a heart stopper. The field was running very deep in this race, with 13 or 14 guys who could potentially take a medal. The favourites stepped it up and launched off the line, setting a quick early pace and splintering the field early. Casper Steinfath (Denmark) hit the first buoy in the lead, followed by Slater Trout (USA) and a string of paddlers that included Fernando Stalla (Mexico), Lincoln Dews (Australia), Chuck Glynn (USA) and Eric Terrien (France). After just a few hundred metres, the top 11 had gapped the other 13 guys in the race. Joining the above six guys near the front of the race were Vinnicius Martins (Brazil), Titouan Puyo (France), Javier Jimenez (Mexico) and Toby Cracknell from Australia. Slater soon took over the lead and sat on the front for most of the first two laps, though throwing everything at him was Fernando. The Rogue team rider was paddling with reckless abandon and nothing to lose, making surge after surge to the front of the field and looking good for one of the medals. However on the final lap Fernando took a fall, which put him back a couple of places and hurt his chances of taking the win. While Slater and Fernando were going back and forth, guys such as Casper and Vinni were sitting behind and playing it smart, waiting to make a move. Lincoln put in a few strong efforts to get near the front, as did Eric Terrien, who had to work his way through the field after a slowish start. Chuck started strong but couldn’t get into a rhythm on the short, bumpy course. Every buoy turn was pivotal as the guys looked to gain a few feet on their rivals wherever they could. The moderate winds and small bumps on Lake Nicaragua played a central role, offering the guys some downwind glides while also punishing those were weak with some stiff headwind sections. Slater was still looking good halfway through the final lap, sitting at the front ahead of Casper, Lincoln, Eric and Fernando. The crazy sprints that Fernando put in earlier in the race started to show though, with the Team Mexico stalwart fading in the final couple hundred metres as his rivals surged. With just a couple of buoy turns left it had become a race between Casper, Slater and Lincoln, as the trio set an incredible pace that dropped the others. Eric Terrien was holding on in 4th but his speed around the buoys cost him a valuable second here or there and eventually broke contact with the leaders. In a frantic final 100 metres, Casper tried to make a move past Slater, the two young guns hitting the second last turning buoy side by side, before a final push from Casper saw him take over the lead right on the final buoy. From there the Danish Viking seemed to find another gear, sprinting clear towards the small turning cans that signal the final 50 metre sprint to the beach. Casper turned a couple of board lengths in front of Lincoln and Slater, who went round neck and neck. The defending champ then channeled his inner viking to power towards the line and secure back-to-back gold medals in this event. The young Dane roared as he crossed the line, while behind him Slater and Lincoln were locked in a sprint through the shallow water to claim the silver. Lincoln’s surf life saving background clearly paid off, lifting his long legs up high and galloping like a gazelle towards the finish to secure himself another silver medal. 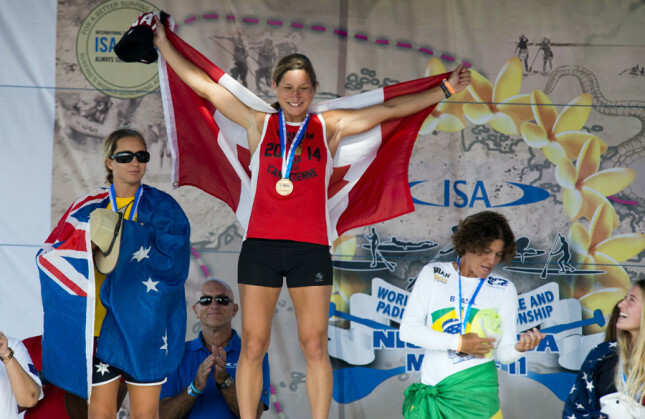 So despite controlling much of the race, Slater had to settle for the bronze. Coming home seconds later was Eric Terrien, giving Team France their third men’s SUP racing medal in two days. Fernando Stalla was impressive for the first 95% of the race but couldn’t finish it off, while Brazil’s Vinnicius Martins again showed he’s a name to watch. After that all that was left was the ISA Team Relay, where prone and SUP were combined in a unique format. With triple points on offer in this event, the overall team medals were still up for grabs. Team Aus had a commanding lead and were favourites to cap off the event with another gold, though USA threw everything they had at their arch rivals. Rhys Burrows went out hard on the first lap and gave the Aussies a clear lead, while newly-minted gold medalist Shakira Westdorp only added to it on the second leg. Nobody was going to catch Jordie Mercer on the third leg, which left Lincoln Dews to bring it home for the green & gold. This relay format is pretty cool to watch. 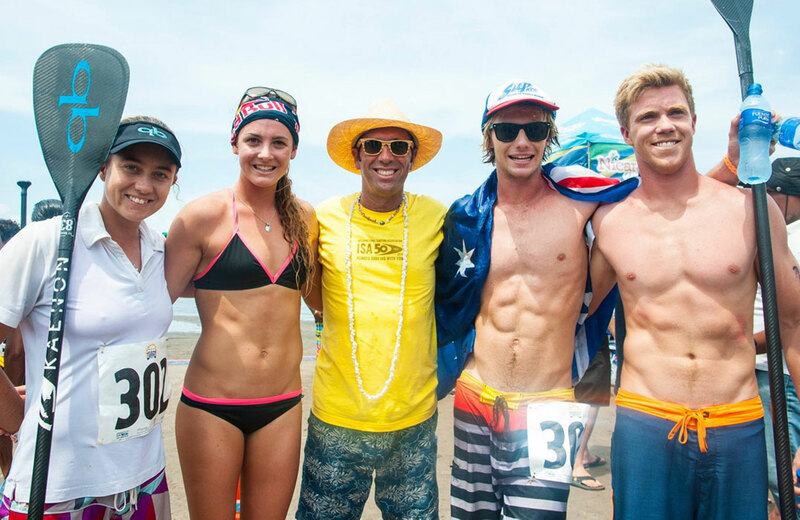 Definitely a good innovation and an entertaining way to finish off the ISA World Championship. 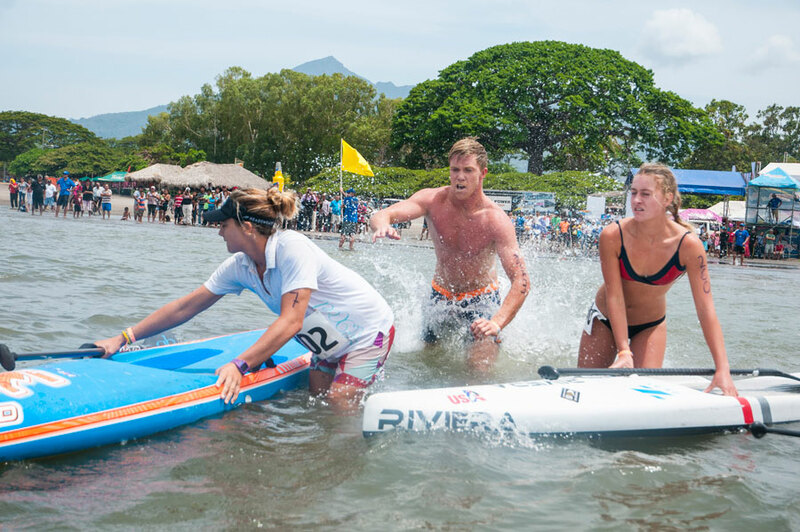 The highlight is definitely seeing each paddler finish their lap with a sprint through the shallows, around a flag and then dive through the air to tag their team mate as quickly as possible. Behind the Aussies, the Americans were looking good for the silver, however a great performance from Team Spain – the definite surprise packet of this whole championship – pushed them right to the line. Belar Diaz anchored the Spanish quartet and actually stuck with Slater Trout up until the final 50 metres of the race. The Spaniards had done enough to secure 4th on the overall team standings though (and were actually very, very close to getting third, just behind Brazil). Speaking of Brazil, Vinni Martins out-sprinted Peru’s Tamil Martino to get the South American powerhouse nation one more medal for the week. This gave them a few extremely valuable points and helped them hold the Spanish at bay on the overall leaderboard. Frustratingly for Team France they were DQ’d from this event on Thursday due to a technical rule violation (didn’t actually see it, but I believe Ti2 snapped his paddle and was quickly thrown a replacement by a team official, which breaks the “no outside assistance” rule). They would have otherwise qualified for today’s relay final, where I think they would have finished around 6th and gotten enough points to hold onto third position in the team standings. The fact that they finished fifth overall on the team standings, despite losing the triple-point opportunity in the Team Relay (their disqualification cost them around 2,000 points in my estimation), shows just how strong these guys are. If they can return next year with prone specialists (which we know France has plenty of) then this group could definitely challenge the Aussies for the overall title. But this was Australia’s week. For the third year in a row the Aussies finished well clear on the medal table. A haul of 6x gold, 4x silver and 3x bronze is an incredible achievement. There was only one event where they finished lower than second (and that was a third…), which gives you a good indication of just how deep the talent runs downunder. Team USA gave them a good push and have more room to improve next year. The Americans were missing a couple of famous faces from their squad, but that turned into a strong positive as it helped expose fresh young talents such as Shae Foudy, who has a bright future in this sport. Tahiti finished 19th out of 27 nations, despite winning one of the first gold medals of the event. That’s due to their small squad and the fact they weren’t represented in any of the racing events. But we all know Tahiti is a paddling powerhouse, so hopefully their stand up paddlers can capture the same level of funding their outrigger crews enjoy, which would help the nation get a very strong contingent to next year’s Worlds where they could seriously challenge. And even nations such as New Zealand would be right up there. They showed this year just how strong their prone paddlers are, and we all know of a certain lady who would be a top four medal certainty in the women’s SUP racing. If the Kiwis can get the funding and organisation it would definitely add another strong contender. Though it’s not like Hawaii didn’t try this year. There was plenty of behind the scenes work, but it wasn’t enough. If the ISA can schedule this event at a slightly more convenient time (clashing with the Olukai race isn’t the best way to attract Connor Baxter, for example) that would certainly help. It was a little strange to see Kai Lenny Instagram’ing from Nicaragua, just an hour away from where the event was happening. His choice not to push to compete in this event but then travel to the same country at the exact same time rubbed a few competitors the wrong way. I appreciate that guys like Kai do more for this sport than anyone, but I do hope they get inspired to represent their nation next year, for the good of the sport. So yeah. Team Hawaii in 2015. Let’s make it happen. Imagine a full strength Australia vs a full strength Hawaii vs a full strength USA vs a full strength France vs a full strength Tahiti vs a full strength New Zealand vs… you get my point. It would be awesome. Of course it’s not just the nations and the individual paddlers that need to commit to this event. It goes both ways. The ISA still has plenty of work to do, for sure, though fortunately they are very willing to listen to the competitors on what they’re doing right and what they’re doing wrong. As much as I loved exploring Nicaragua, I don’t think the split location setup works at all. Even in a modern country with perfect logistics, it detracts from the atmosphere and team spirit of the championship. However in a country with Nicaragua’s quality of infrastructure, it also adds a real headache for the teams (and an even bigger one for the organisers…). Or if we do have to split locations, at least pick a better spot for the surfing. La Boquita was quaint, but it was also a pretty ordinary wave. There are world class spots an hour to the south. If we have to change locations halfway through the event, at least change to a good spot. I get the feeling La Boquita was chosen because it was the closest surf break to Nicaragua, which was always going to be the main event site. It’s 90 minutes drive from Granada to La Boquita. It’s 100 minutes drive from Granada to the famous Colorado’s and Popoyo surf areas. The scheduling needs to be looked at in 2015. For starters the ISA needs to ensure their local organising partners choose a date that fits in with the international SUP racing calendar, otherwise they’ll struggle to attract the marquee paddlers. 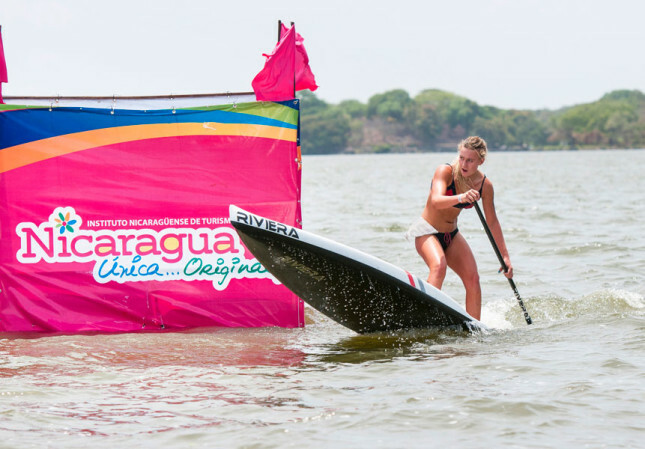 Nicaragua clashed with a couple of major stand up events, which didn’t make it easy for some of the “on the fence” nations to commit. In addition, the event itself probably ran a couple of days too long. If we stayed at one location we could have avoided Wednesday’s transition day, while the racing events could have easily been done in three days instead of four. Finally, if organisers could move the opening ceremony to the morning of the first surfing day then suddenly we’d go from 9 days down to 6. Much more manageable. 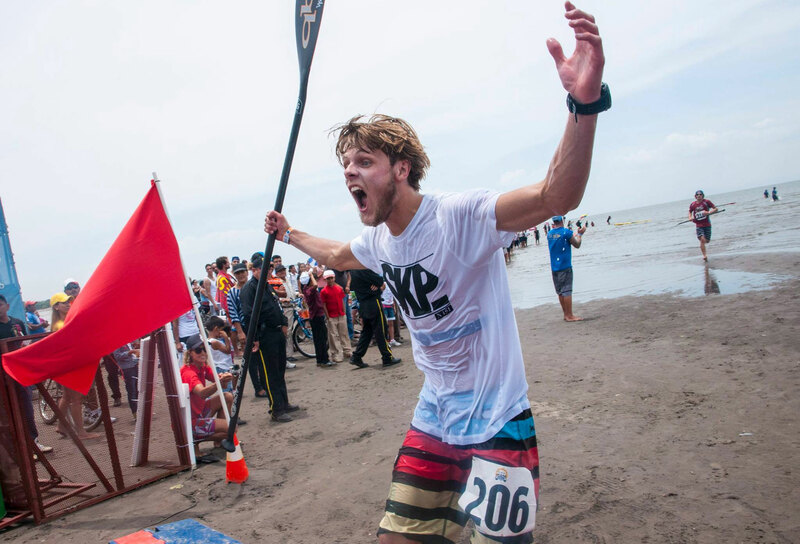 I know for a fact several eligible paddlers didn’t come to Nicaragua because they couldn’t afford to take so much time away from work, so shortening the event could solve part of the participation issue. 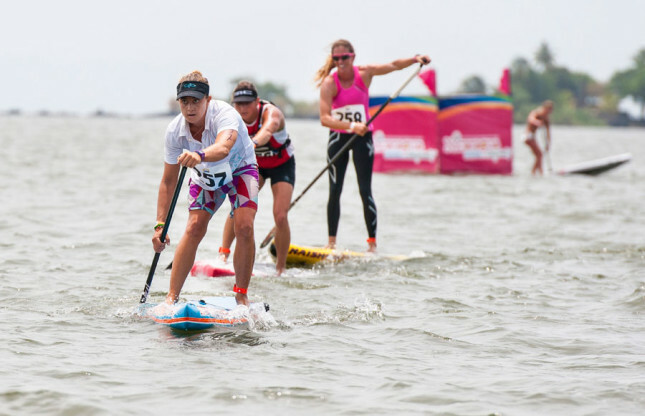 Some stand up paddlers question the inclusion of prone paddleboarding in the Worlds. I’ve got nothing against sharing the stage with the prones, after all they’ve been doing their thing for about 100 years longer than we have. It adds an interesting element for sure. However it also skews the results, because most nations can’t muster a competitive prone paddler. I think this needs to be addressed somehow, either by adjusting the points or, better yet, by the ISA strongly encouraging more nations to find quality paddlers in their ranks. The choice to go in the flat was something I questioned a few months ago, however it actually paid off big time. There were two genuinely exciting distance races through a very unique, exotic and beautiful course. The Lake was a success, so I wouldn’t be surprised if we stay away from the ocean next year as well. I still miss the ocean and the waves though, it’s always more exciting with waves… Perhaps a compromise could be holding the distance race in the flats and the course race in the waves. Or even vice versa… Do a real downwinder in the ocean (how good would that be!) and then have the course race in the flats. 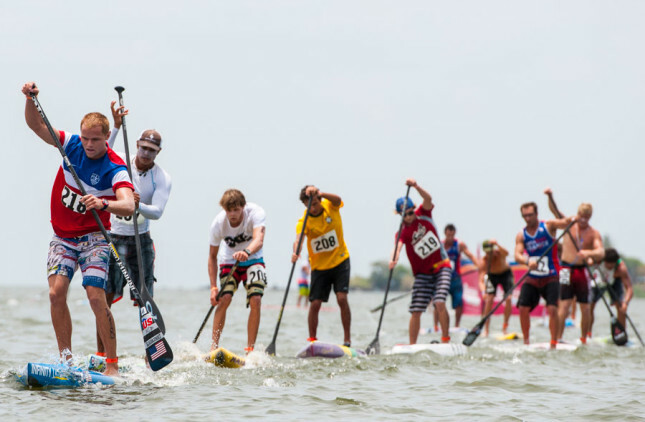 If this sport ever gets to the Olympics, it’ll probably be in the form of a flatwater technical course race, so this compromise could work for everyone: The ISA gets to showcase future potential, while the ocean-going paddlers still have something to look forward to. Next year I would really like to see this event leave Latin America and venture to new shores, as would pretty much every other paddler that I asked this week. Three years in a row is plenty, it’s time to explore new frontiers. 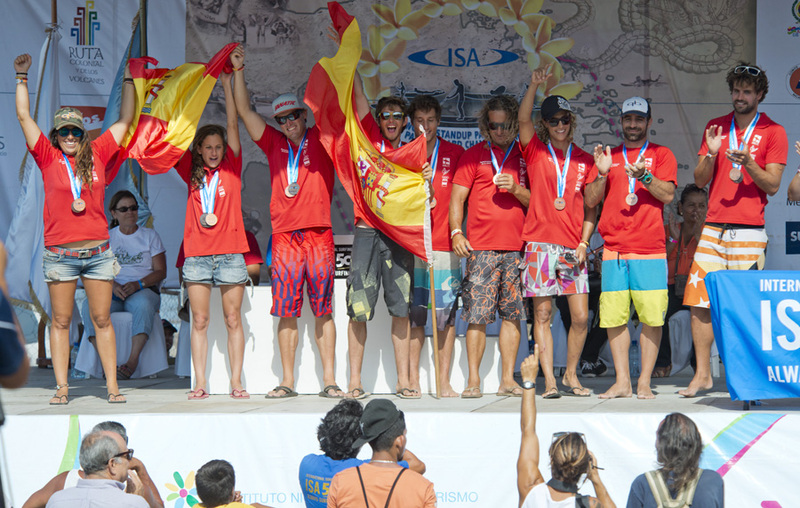 Imagine having the ISA Worlds somewhere like northern Spain or the south west coast of France! Though I have a feeling we’ll be back in this part of the world next year; the ISA simply has too many good contacts and too much access to the crucial private and public funding in Central and South America. I’ve gotta say the setup for this event was amazing. The grandstand on the beach at the Lake, where the competitors were made to feel like stars and where they got a great view of the action on the water, was nothing short of impressive. It felt more like a pro surf surf contest than a SUP race. But with that comes costs, which needs financing, which means we’ll probably be back in LatAm as the ISA has a much better chance of securing the funds here. Still, if any Euro countries wanna step up and foot the bill, I’m sure the ISA would jump at the chance. Just think how many nations would enter the event if it was held in Europe!? But anyway I’m getting ahead of myself, that’s a discussion for another day. For now let’s enjoy the after party and celebrate what was a successful and entertaining week of paddleboarding. Huge congrats to all the medalists. From Ti2’s heroics in the distance to Casper’s Viking power in the course race, to Lina and Shak trading golds and silvers in the women’s events. Lincoln stepping up for Team Australia. Young Shae pushing herself beyond the red line. It was pretty epic. And as my co-commentator Jamie Mitchell pointed out several times today, the big takeaway from this event isn’t that Australia won yet another swag of medals, or that USA and France showed how strong they are. The real takeaway was how well some of the emerging nations are doing. It was great to see the improvement in just 12 months from teams such as Peru, while the Spaniards gave everyone a show and Casper continued to fly the flag for Northern Europe in the racing. Every nation that competed here this week had a story. 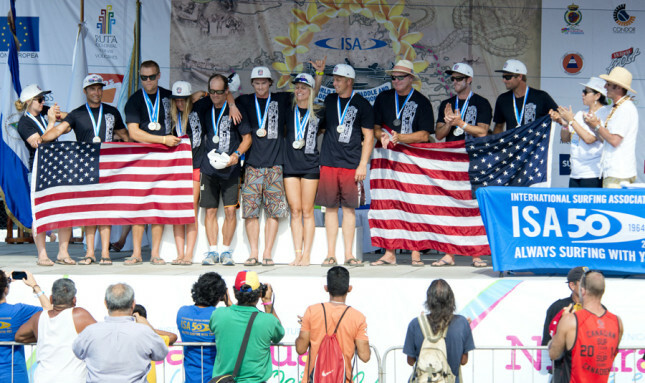 This is what the ISA Worlds are all about. If you think it’s trying to be the next Battle of the Paddle you’re missing the point. 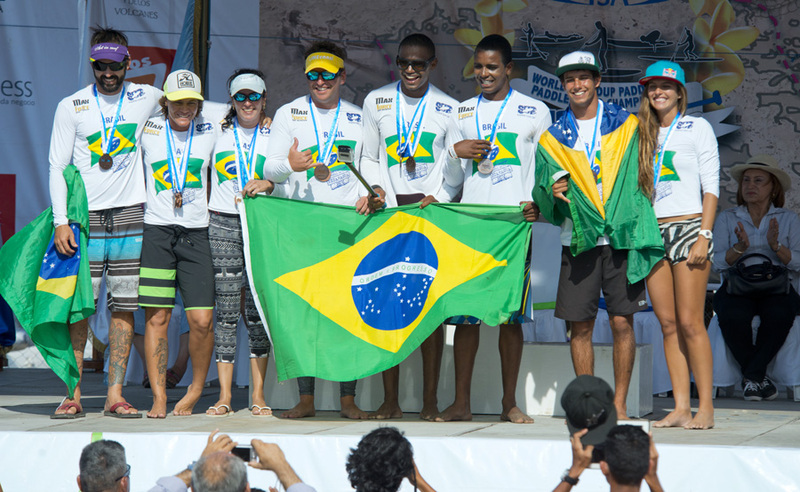 This isn’t *only* about elite competition, it’s about drawing nations together to celebrate the sport while exposing SUP to more and more corners of the globe. I’ll be back next year for sure and I hope many of the big name paddlers are there too.